What should I do if I have neck, back, arm, or leg pain? How do you test myotomes? If you're a student in a healthcare profession, or you have simply been in to see a doctor or physiotherapist for an injury or general pain, you may have already heard the term "myotome". While it sounds fairly advanced and something you might not need to know if you consider yourself part of the general population, I definitely think it's worth knowing a little more about, especially if you are suffering from neck, back, arm, or leg pain. Therefore, in this article, we will explain what myotomes are, why they are important, and what to expect if your healthcare provider suspect that they may be part of your condition. Myotomes are key muscles supplied by a single nerve root. That means each myotome is associated with a single specific nerve root. So why does this matter? In order to understand this better, we need to back up a little bit and understand what a nerve root is and what it does. Nerve roots are basically nerves that come out of your spine, but haven't yet branched into separate trunks, divisions, cords, and ultimately single peripheral nerves. Your spinal cord comes down from the brain and runs through the intervertebral canal, also called the spinal canal. 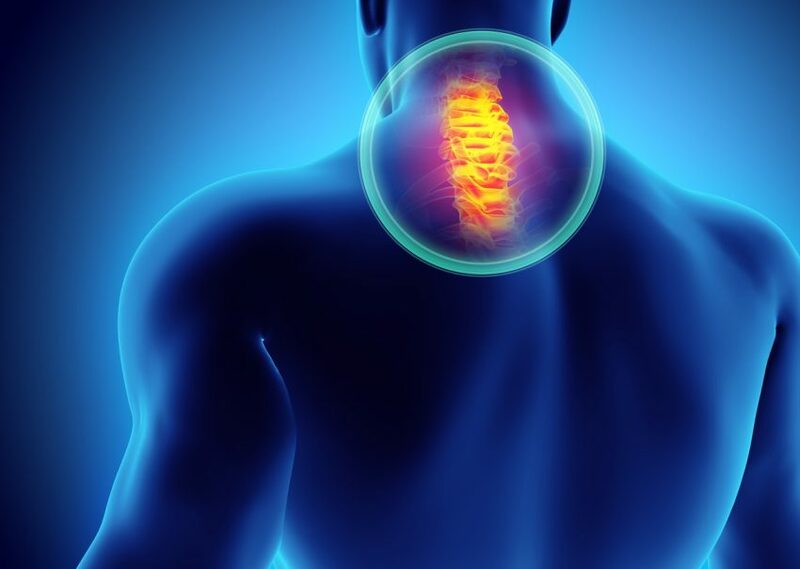 This canal is formed by the connection of all the vertebrae in your spine, whereby it essentially forms in inner tube that the spinal cord can travel down through. Your spinal cord is what send off nerves. The very foundational part is the nerve root. These roots are not very long, but they are not to be underestimated. These nerve roots exit the spine and go on to continue branching out, ultimately supplying the whole body. Generally speaking, the nerve roots that exit the cervical spine (neck region) go on to supply the upper body, and specifically, the arms. The nerve roots that exit the spine around your mid-back (thoracic region) end up supplying your chest and abdomen. The nerve roots that exit your lower back (lumbar and sacral regions) end up supplying the hips and and legs. As I mentioned previously, these nerve roots go on to branch out and supply different areas of the body. However, we can actually trace the course of all these nerves, and there have been key muscles identified that, when we trace back to the spine, are supplied by specific nerve roots. So why does this matter to the average person? Before we go further, I would like to quickly declare that examples and information I provide below is to be considered general. If you're looking to diagnose your exact issue, I would highly suggest visiting your doctor or physiotherapist. Have you ever experienced arm or leg pain, only to be told the problem is with your back, neck, or something like your posture? At first, it doesn't really seem to make sense, but knowing a little more about nerve roots can help shed a little bit of light on the situation. Sometimes people can develop arm or leg pain that seems to increase over time. There may or may not be a cause to the pain, that is, you might be able to think of a specific instance when you might have experienced an injury, but not always. The type of pain that I'm thinking of generally goes below the elbow or knee, and is usually located on just one side of the body. It may feel like a dull, heavy pain, or it can also be a shooting, zinging type pain. In most cases, the pain is really hard to alleviate, and becomes increasingly frustrating to deal with. This is the type of pain that is often associated with nerve root problems, and when you may hear "the problem is with your neck or back". If something has happened to your neck, there is so much stuff surrounding those nerve roots that, if there is any inflammation or compression, can actually irritate or damage those nerve roots. Since those nerve roots go on to branch out and supply a bunch of different areas in the arms, the problem at the level of the nerve roots can actually send the symptoms downstream to the area they supply, which is why you may feel pain in your forearm or hand when the actual problem is in your neck. Similarly, the same is true for leg pain and nerve roots in your lower back. This type of pain that extends all the way down the leg or arm (past the knee or elbow) is referred to as radicular pain. So how can this happen if you haven't actually hurt your neck? One major culprit is poor posture. To be clear, no one has perfect posture, but some people have worse posture than others. By bringing the neck or lower back out of its intended alignment, we can gradually build up stress in those areas, leading to nerve root problems. Over time, the pain may become worse and worse, until you get to the point where you need to seek help. This is especially the case for those who work at a computer or lab bench, and is now becoming a way bigger problem with smart phones (e.g. "text neck"). Sitting at a computer all day may not seem like a lot of physical work, but with a rounded lower back, rounded shoulder, and especially a forward chin-poke, a recipe has been developed for gradual nerve root problems. By maintaining a bad posture, you are essentially conditioning your body to remain in an alignment that will at some point, undoubtedly, affect the nerve roots exiting the spine. First off, visit your doctor or physiotherapist. Depending where you live, you may or may not need a referral from a doctor to go see a physiotherapists. Also check with your insurance coverage, if you have any, to understand if there are any financial issues you need to be aware of as well. Physiotherapists are extremely well-verses in dealing with problems like this. They have the knowledge and tools to identify what the problem is, even down to the exact nerve root that may be presenting issues, and can educate you as to why this may be occurring. Additionally, they can provide treatment in the clinic to help alleviate your pain and get you back on track, and most importantly, they can give you things to do at home or work that will help keep that problem at bay, and eventually lead to you feeling much better. Physiotherapists have specific tests they can do to understand if a nerve root is causing a problem, and if so, which one it is. Among these tests are range of motion testing, looking at how your arms and legs are moving, skin sensation testing, reflex testing ,etc. However, the one that really utilizes myotomes to pinpoint the issue feels a lot like muscle strength testing ("myo" generally refers to muscle tissue). The physiotherapist will perform a variety of muscle strength tests, but they are not actually looking at the strength of the muscle itself, but rather, that muscle-nerve connection. Instead of getting you to lift weights or move through a certain motion, they will place your arm or leg in a certain position, instruct you to hold it there, and will push on it from a certain direction while you maintain that exact position. They will hold this push for at least 5 seconds, maybe longer, and what they are looking for is your ability to maintain that position. If a nerve root is affected, one position will be very difficult to hold for that duration of time compared to the other positions, as well as the other limb. This will be more important to you if you are a student, but if you're a patient looking to learn more, it should also help figure out why certain tests are being performed. The nice thing about learning myotomes is that it's all fairly standardized. There are specific tests e can do that are shown to be reliable, they are easy to do, and also quite easy to learn. Here are examples of myotome charts below, with some additional information about the actual testing. This chart is technically a dermatome chart (see article on dermatomes), but it gives you an idea of how nerve roots go on to supply certain areas of the body specifically. So how do they test these using muscles? Let's say we are testing whether or not the C4 nerve root is the problem (C4 = nerve root that exits just above the 4th cervical vertebra). In this case, the muscles that are eventually supplied by the C4 nerve root all help to perform the shoulder shrugging motion. The physiotherapist may ask you to shrug your shoulders up towards your ears and hold them in that position. The therapist will then push down on both of your shoulders and will instruct you to remain in that shrugged position, and you will hold this for at least 5 seconds. If one shoulder becomes weak and drops after a few seconds, this is an indication that the C4 nerve root is somehow compromised. In the case of the lower back, another example could be the L5 nerve root, which exits below the L5 vertebra. If they want to test whether or not this is the nerve root causing pain in your leg, they can test the L5 myotome, which is either big toe extension or ankle eversion. Big toe extension, which is the act of bringing your big toe up towards the ceiling, is usually easier to do. Similar to the example above, the therapist will place your big toes in this extended position and will instruct you to hold them there while they push down on your big toes. Once again, if one becomes weak and drops while the other stays up, this is an indication that the L5 nerve root could be the source of pain, and not an actual injury to the ankle or foot. The videos below provide a brief overview of what you can expect if your physiotherapist wants to perform some myotome testing. These are not all the tests they can do, but are some of the more common ones associated with radicular pain, and it simply gives you a visual of how it's done. Below the videos we will supply slightly more comprehensive charts indicated what nerve roots, muscles, and actions are involved in most of the myotome tests. There may seem like a decent amount of information here, but in reality, this is only the tip of the iceberg. Nevertheless, this should help provide you with a general understanding of the incorporation of myotomes for the diagnosis of nerve root problems and subsequent treatment. If you are suffering from what you think could be radicular pain, we still encourage you to visit your doctor or physiotherapist regardless. They will be able to help make sure there isn't anything else going on, especially if you have other symptoms. Sometimes things that may not seem related to a musculoskeletal issue can in fact be highly relevant, and we haven't touched on those things here because it would be a massive list to get through. In our next articles, we will talk about dermatomes and reflex testing, as well as discussions on the differences between referred pain and radicular pain (e.g. "sciatica"). Until then, please feel free to browse are other educational information, keeping in mind this is all general info, but we are all unique individuals.